Young or Old, the Pirate Cruise has Something for Everyone! 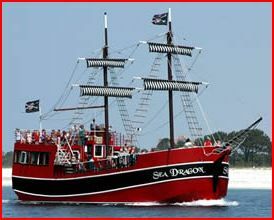 Cruise away into the fantasy world of friendly swashbucklers and spirited pirates aboard our real 85' pirate ship. Our journey cruises within cannon shot range of the shores of Shell Island. Frequent sightings of the playful dolphin, gliding seagulls, pelicans, and other mysterious marine life just adds to the excitement. BEWARE MATEYS! You may be required to do a little sword fighting or fire the kid cannon. After you and the other pirates have discovered the treasure and take your share of the loot, you will be invited to party hearty with festive music, games, and dancing all the way back to dock. For ye noble pirates, cold beer, wine, margaritas and rum punch are available. Sodas, bottled water, pink lemonade, "Dragon tail" hot dogs, and other fine snacks as well as treasured keepsakes can be purchased in the galley. Arrh Matey! You'll sound and look like a pirate when you depart ye fine ship. Private Charters are available for Birthdays or Corporate outings. Call for more information on private cruses.